Mattel's Monster High™ and Universal Home Entertainment Form New Worldwide Marketing and Distribution DVD Partnership | Mattel Inc.
LOS ANGELES--(BUSINESS WIRE)-- Mattel and Universal Pictures today announce a worldwide marketing and distribution alliance for the first ever feature-length DVDs from the hugely successful Monster High™ franchise. Monster High™: Ghouls Rule! will be the first direct-to-DVD, CG-animated film to be released under this new partnership. Centered around the perfectly imperfect teenage children of the world's most famous monsters, Monster High™ resonates with girls across the globe for its clever and humorous storytelling that captures the awkward, yet relatable, moments of being a teen in high school. Now in more than 35 countries, the Monster High™ characters - each with their own unique personality, fun freaky flaws and cool monster heritage — have become the #2 largest Fashion Doll property in the U.S. according to The NPD Group. The Monster High chapter book series is a New York Times best seller and the animated webisode content has topped more than 140 million video views. "Monster High has become a global phenomenon, uniquely engaging fans around the world with its universal truth — everyone has times when they feel like a monster, struggling to be comfortable and confident in their own skin," said Stephanie Cota, Senior Vice President, Worldwide Marketing, Barbie and Girls at Mattel. 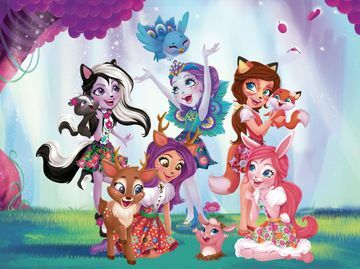 "Universal is truly an expert in home entertainment marketing and distribution and the ideal new global entertainment partner to assist Mattel in continuing to bring Monster High's rich storytelling to new platforms and audiences." "Monster High is a growing global sensation with explosive popularity," said Craig Kornblau, President, Universal Studios Home Entertainment. "There is no better time to extend our hugely successful alliance with Mattel to include this exceptional brand that will deliver new and engaging home entertainment content to its rapidly expanding fan base." Added Eddie Cunningham, President, Universal Pictures International Entertainment: "We are excited to be working with Mattel and look forward to being part of the Monster High phenomenon around the world. We believe our home entertainment alliance with Mattel and its Monster High brand will build on the success we currently enjoy with Barbie." The first Monster High™ direct-to-DVD movie, Monster High™: Ghouls Rule!, features all of the beloved student bodies of Monster High™, and chronicles their quest to take back Halloween. When Frankie Stein™ and her friends discover that ghouls used to rule Halloween, the crew sets out to take back this holiday, originally created for them, and restore it as a day when monsters celebrate their individuality. Mattel will also introduce a new line of fashion dolls, to complement the DVD release, which will be available starting this fall. Rooted in the dynamic storytelling moments of Monster High™: Ghouls Rule!, Monster High® unveils freaky fab Clawdeen Wolf®, Frankie Stein®, Draculara® and Cleo De Nile® fashion dolls, each featuring killer hairstyles, sparkles and accessories that pay homage to, and celebrate, their famous monster heritages. Universal Studios is a part of NBCUniversal, one of the world's leading media and entertainment companies in the development, production and marketing of entertainment, news and information to a global audience. NBCUniversal owns and operates a valuable portfolio of news and entertainment television networks, a premier motion picture company, significant television production operations, a leading television stations group and world-renowned theme parks. Comcast Corporation owns a controlling 51% interest in NBCUniversal, with GE holding a 49% stake. MONSTER HIGH and associated trademarks and trade dress are owned by Mattel, Inc. ©2012 Mattel, Inc. All Rights Reserved.